If you are new to herbal tea, do not expect me to tell you about a mysterious diet or detox plan ! But herbal teas can improve your overall health in many different ways. Perhaps, some of you may think that herbal tea tastes like infused grass from your backyard ! Or maybe you had tasteless experiences ! 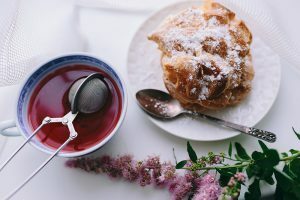 Well, even though some herbal and medicinal teas might not have much of an interesting flavor, there are ways to pimp your teas and to benefit from their properties ! Here is a little guide to herbal teas and tisanes and how to incorporate them in a healthy diet. Find single herbs organic teas in teabags here. What Is Herbal Tea And Why Drinking It ? First of all, an herbal tea or a tisane is an infusion made with plants, the boiling water allowing to extract the properties from the plants, flowers, fruits or roots or a blend. There are different types of preparation made with plants for medicinal purposes, like extracting the properties with oil, alcool, sugar or vinegar. I will focus here with the water extraction, which I find is the most simple and pleasant. Herbal tea can be made with fresh herbs or dried ingredients. I recommend to find organic herbal teas or to grow your own ! Herbal teas are great for health and can help with different health problems depending on the plant. When dried, herbs preserved their aroma and essential flavors. The herbal tea does not contain “tea” from the tea plant in the family of Theaceae. Therefore, it is a good caffeine-free alternative, because yes, regular tea contains caffeine. So, if you want to drink less coffee during the day, why not take an infusion ? 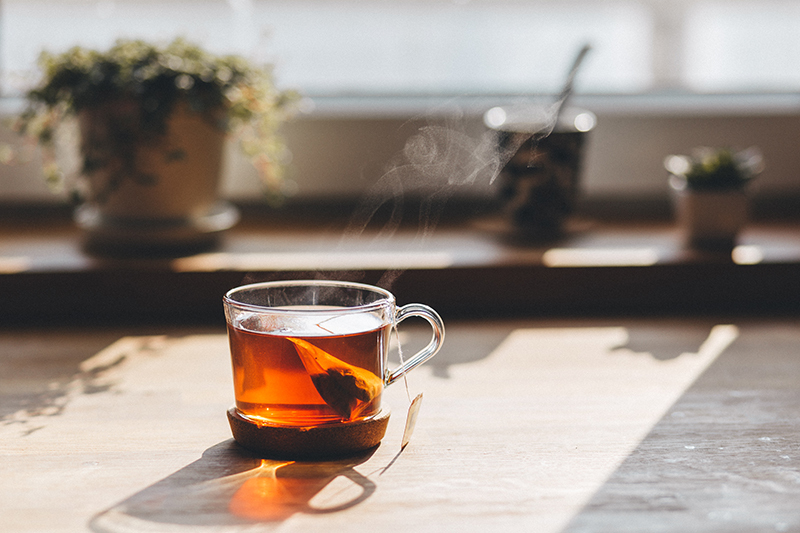 Preparing herbal tea can be part of a healthy routine and can help to replace a cigarette break, that extra coffee or just to relax before bedtime ! To get used to the tastes, trying single herbs teas may be a good start. That way, you can really find what kind of flavor you like, how long you like to infuse it for and what is the effect on your body. After trying single herbs teas, you can combine your favorite herbs to create tasty blends or get a blend in teabag with flavors that you like. When creating blends of your own, it is a good idea to combine herbal teas that have similar effects on your body. For example, you can make a relaxing blend and one that is more spicy and energetic ! Although, it might be an investment to buy all the single herbs tea separately when starting and also to understand their unique benefits. Sample boxes of herbal teas are a wonderful start, like this one here from Pukka Tea Organic. It is also good not to drink the same herbal tea all the time (like anything! ), but to change from day to day, depending on the season and how you feel. It is generally advised to take breaks of certain plants, so just make sure you have a good selection ! Some herbal teas may interact with medication or cause allergies, so it is important to ask your doctor if you have a medical condition or if you are pregnant. Which Herbal Tea Do I Pick ? Find single herb herbal teas in teabags here. To start, I would recommend trying mint teas, ginger (infusing freshly sliced ginger root with a splash of lemon), chamomile or lemon balm before bedtime. These flavors definitely do not taste like your backyard’s lawn ! If you want to try something more on the spicy side, an excellent choice would be a chai rooibos tea which is a caffeine free tea with the most delightful spices ! I really enjoy using loose leaves tea as I can blend and dose it the way I want, knowing that there are no artificial flavors. But for starting and discovering new flavors, it is sometimes easier with teabags. I started with Yogi teas as they offer good variety of blends. I like Yogi teas also because there is a lovely thought written on each teabag ! Here they offer a pack of 9 different quality herbal teas. You will have peppermint, lemon and ginger blend, chamomile, and 6 wellness blends. Traditional Medicinals Organic Herbal Tea offers here a nice pack with peppermint tea, raspberry leaves (great for PMS!) and roasted dandelion roots (diuretic). How To Brew Herbal Tea ? You will need a tea kettle, an electric one or the classic with that whistles. You want to look for one in stainless steel, enamel or ceramic. How to brew ? Well, brew it the way you like it ! There is no point in preparing an infusion that you do not enjoy, but it might take a few tries to develop the taste and habit. So do not give up and experiment ! When infusing, it is important to boil your water and wait a few seconds before pouring the water on the tea so it is not boiling hot. Use filtered water if possible. Cover your tea when infusing to keep the aromas and properties from evaporating. All herbs, blossoms, roots, spices have different compounds that vary in intensity when infused. Some plants have a more vibrant taste and therefore less leaves would be sufficient. Another herb might need more leaves and longer infusion time. For example, roots and spices can be infused for longer. You will find in the section Benefits of Drinking Herbal Tea, information about specific teas. But here is a general guide to brewing herbal tea. Note : If you start loving herbal teas, you will want to look into teapots and perhaps brew more at a time. I find that often one teabag is good for a small/medium teapot. Please note that it is not forbidden to eat your favorite dessert with your herbal tea ! Grow your own herbal teas ! You have a sunny balcony or a corner of your backyard that isn’t being used ? Plant some herbs ! Find out what are your favorite herbs and just try to grow them. Lemon balm, mint, basil, thyme, chamomile are quite easy to grow. As a start, I would recommend lemon balm and/or mint. Be aware that they spread fast, especially the mint, and might take over the garden, so just choose an area where it can spread. Both lemon balm and mint will come back year after year, so it is a great investment ! 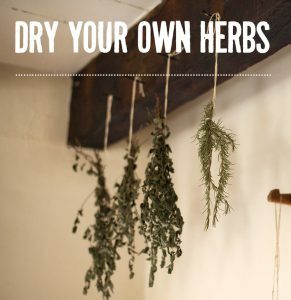 How to dry your herbs ? Attach the herbs in small bundles and hang them upside down. Dry slowly in a shady place with a good airflow until they are crispy dry. Keep your herbs in a closed jar in a cool, dry and dark place. Still not sure ? …. In conclusion, incorporating herbal teas in your diet is simple, just try it out and experiment with the flavors. Brew your tea the way you like it. If you are still not convinced, add a little honey, a leaf of mint or a splash of lemon ! Make it a moment of pure happiness ! Enjoy ! … and smile ! I am also always discovering new tastes, tell me, what is your favorite herbal tea or WHICH ONE WOULD YOU LIKE TO TRY ? Leave a comment ! This is something I have been wondering for some time now, I have heard all the hype about herbal tea but never really tried any of it. I recently suffered with a heart attack and I’m only 38 so I think I should start looking after myself. Can you recommended any herbal tea that strengthens your heart or is good for it? Organic hibiscus herbal tea can support a healthy cardiovascular system as well as turmeric tea. It is important not to go overboard, but to introduce slowly herbal tea in a daily routine, in moderation. You can infuse teas very lightly as a start. There are so many different flavours to try, blends are great because you can have a medicinal herb that is perhaps less tasty along with some delicious flavours that will cover a bitterness. For example, the turmeric tea here is a blend with ginger, which spices it up ! I hope your health is getting better Matthew and I have to tell you (!) not to take my recommendations as advice and ask you doctor since you suffered from such a serious condition…. Stay well, thanks for dropping by ! It is also just a nice relaxing moment to prepare herbal tea… and even though there is perhaps a hype around herbal teas, they have been around for sooooo long ! Chai rooibos is an excellent choice with spicy flavors. What is great about Rooibos tea is that it is caffeine free. Thanks for dropping by ! Thanks for posting. Definitely walking away with a lot more confidence after reading your post. Now I can walk into Teavana and at least know where to begin when asking about single herb teas. Thanks for visiting ! I’m glad it helped ! I am a huge tea lover but I recently quit because black tea was giving me horrible stains on my teeth. My teeth looked like that of a smoker even though I never smoked cigarettes in my life! I switched to herbal teas like chamomile and lemon balm for sleep but I even quit that as I got my teeth whitened and I’m scared of getting the same stains again. The chamomile and lemon balm are so effective to calm me down before sleep and I want to continue but at the same time I don’t want my teeth to become all yellow and badly stained again. Do herbal teas stain the teeth? Are they as staining as green and black tea? Do you have any tips how I can reduce the staining effect? Hi Vanessa ! The tannins in black tea are responsible for staining teeth. To prevent or reduce the staining effect, drinking water after tea could help or brushing teeth … or drinking tea with a straw… which might not be the best idea ! 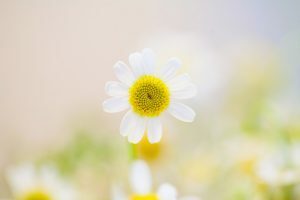 Most herbal teas do not have tannins, so I am positive you can keep drinking chamomile and lemon balm without any worry because they do not contain tannic acid. Thanks for your comment ! Thanks so much for your response! I’m relieved that I don’t have to give up herbal teas. In fact I restarted drinking lemon balm and I sleep so much better. So far I don’t see any staining effects which is great. Your post reminded me that it would be a lovely thing to go brew some good herb tea. I prefer to drink tisanes cold and I’ll keep a pitcher of cold-brewed tea (usually a mix of a half-dozen favorites that just taste good together). My own favorites tend to be on the spicy side. For a pitcher of tea, for example, I’ll hang teabags of chamomile, mints, lemon balm and lemon and ginger — one bag per one cup of water. I throw in stick cinnamon, star anise or cardamom to make it lively. Sometimes I’ll crush some black pepper and add that to the brew. I let the things sit in the refrigerator overnight. I pour the tea through a small strainer balance on the lips of the cup and throw the spices back in. Lovely. Thanks for your inspiring comment ! It gives me an idea for a post about cold herbal teas ! You are right, a cold herbal tea is so lovely and refreshing. What is great is that herbal teas have the same properties hot or cold. The blend that you describe sounds delightful and I will definitely try it on a hot summer day. I particularly love cardamom ! Cold herbal tea is a fantastic way to drink more water in the day and replace juices and other drinks with a healthy flavored water. Thanks for visiting ! Hi! Thanks so much for this delightful article on herbal tea. I love loose leaf tea. Peppermint is my favorite, but I’ve never actually thought of growing and drying it myself before. It seems pretty easy to do. Once the mint has dried, how do you store it so that it stays fresh over the year? You just store the mint in tightly closed jars and keep the jars in a cool, dry and dark place. It can be in tins or mason jars. I always put a small amount of the herbs in small tins on the counter for everyday use. It is recommended to keep the dry herbs for a maximum of one year to keep all the aromas and properties. Thanks for your question and for visiting ! 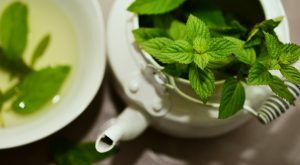 Previous Previous post: 12 Great Benefits of Drinking Mint Tea – And More !